Where to Buy Nautical Charts Online - The New England Trading Company, Ltd.
Where to Buy Nautical Charts Online? Essential tools for navigation, nautical charts depict maritime and nearby coastal areas to identify depths of water, height of land, seabed features, hazards, tides, currents, and more. Plus...they look very chic in your coastal getaway. In fact, they've grown in popularity in recent years for home decorating projects. You can gain access to thousands of high-resolution printable nautical charts from the Office of Coast Survey and download them as PDFs. Here's an example of one I downloaded depicting Martha's Vineyard to Block Island. What can you do with these nautical gems? The crafting options are endless! Spruce up old chairs into charming coastal pieces with a little sanding, polyurethane, and Mod Podge... here's a fun tutorial on how to get it done. 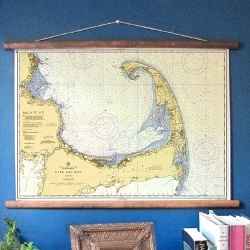 Now, for those of you looking for a more instant coastal transformation, check out our new line of Vintage Style Nautical Charts. These superb nautical map reproductions are digitally restored in full color from 1950 when they were still being drawn by hand. Scan our collection from Cape Cod, Martha's Vineyard, Naples & Marco Island, and many more. Each is printed on heavy-weight large vellum paper and installed on a wood scroll. Ships to you in a tube and is ready to hang - voila! Instant gratification. Do you have fun ideas for re-purposing old maps? We'd love to hear about them!